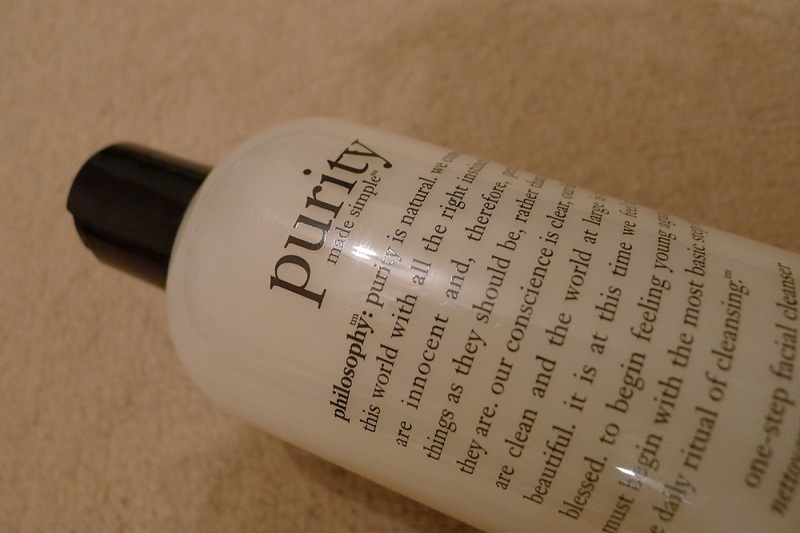 The Philosophy Purity Facial Cleanser is a “natural” cleanser and is fragrance free – there is a bit of a distinctive smell though despite being fragrance free, which I had to get used to. The cleanser claims: “Cleanse, tone and melt away all face and eye make-up in one simple step, while lightly hydrating the skin” – this I can say in my opinion is true to a certain extent. As I am always wearing eye make, to find a cleanser which can remove this gently without having that “torturous stinging eye” effect is an achievement in itself. The Philosophy Purity Made Simple Facial Cleanser not only removes all stubborn eye make up including gel eye liner and mascara, it is also gentle on the eyes. As for face make up I do find that it removes everything gently without over drying or leaving the skin with an uncomfortable “taut” feeling. The cleanser is of a quite creamy and slightly thicker consistency, but is still runny like liquid. At £17.50 per bottle (8 fl. oz/240 ml) the Philosophy Purity Made Simple Facial Cleanser is steeper than your traditional drug store brand cleanser. However in my opinion because I have found it difficult to find a cleanser that is of this quality I would say it is well worth the price. To use the Philosophy Purity Facial Cleanser I tend to first dampen my face with warm water and then squeeze a small amount of cleanser into the palm of my hand. I will then proceed to add some water and rub together to create lather. I then apply this all over my face and massage in circular motions. I tend to pay particular attention to my eye area as I said before it is where I wear the most make up. After massaging for a few minutes I will then rinse with warm water and finish with a splash of cold water, just to close the pores. I will then pat dry my face and apply my skincare products. My only vice with this product is the packaging… This cleanser is always prone to leaking! I have to make sure I’ve wrapped it tightly in a bag AND make sure it’s standing upright in my bag to minimise the leaking. I hope they improve on this because then it really would be absolutely perfect.